Anyone who knows me knows that I am a very competitive individual. That competitive nature raised it’s head when I began to consider the best way to propose to Athena. I had heard many stories of terrifically romantic proposals; hot air balloons, carriage rides, standing in the parking lot of Mega Foods, and so on. But when it came time to pop the question the stars were aligned for me and the setting couldn’t be more perfect. On a drizzly day in a fantastic palace in Vienna Austria, Athena and I casually strolled throughout the palace gardens gazing at the beautiful sites. Along the way Athena reminded me of her desire to kiss in the rain, like in the movies. 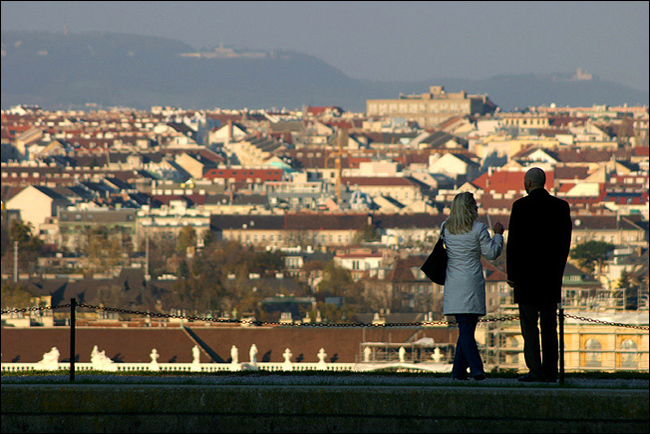 As we made our way up to the top of the Gloriettemonument and gazed out across the fabulous view of Vienna I realized the timing couldn’t be better. pretending to be retrieving a bottle of water from my backpack I knelt down and clumsily pulled out the ring while simultaneously sputtering some type of sappy,”you are my everything” line. I’m not really sure of what I said but it worked because she agreed and we were finally able to fulfill her movie like rain kissing fantasy. Later that evening we enjoyed a delicious meal and a classic Mozart concert before traveling back home the next day. All in all I thought it was just about as good as you could do in a proposal. And then today I saw a proposal that was pretty darn good and maybe even better. Generally I tend to look down upon guys who propose at football games, but this one was kinda special. Catch a glimpse of it here and read the story about it here. Let me know which proposal you think is better, or if you’ve got a story of your own you can throw that into the mix as well. WOULD have been one of the all time best proposals if it wasn’t for the doofus Chris Myers blowing it! Stephan, is it your cathedral in the middle of town? Yeah Chris Myers did blow it, but if he hadn’t would it have been televised? and if it wasn’t televised would it have been as good? BTW where do you rank your Halloween giant box proposal? Well obviously Myers knew about it, so he should have just asked if he had anything special he would like to say and then handed him the mic. As for my proposal…. I think it was pretty creative, but I couldn’t have done it without help from Mom, so I can’t take all of the credit. I’ve always said I’m more of an idea man, let me come up with the ideas and have someone else do all the work! FYI for those who don’t know what we are talking about: I proposed on Halloween and I did so by ringing Joy’s doorbell, hiding in a giant ring box (which my Mom made), and then when she opened the box I was down on bended knee inside with the engagement ring. It was all very romantic, but it may have been a little awkward for the kids in the sponge-bob and spiderman costumes who were standing next to me hoping to get some candy.